Esmerio's Master Carpet Care, Inc. has been serving in the Inland Empire area (which includes Montclair) for over 23 years, and this guide has been put together to help you better understand the differences between area rugs and a short price list with a first time customer special. There are 3 basic types of rugs: Hand Knotted, Hand Tufted, and Machine Made. All of these rugs have unique qualities that fit the lifestyle and budgets of our clients. Some are made from wool and other natural fibers while others are made from a synthetic fiber. They all require individualized special care during the cleaning process. Hand Knotted - A complex pattern can require very dense knotting and it can take a long time to produce. An average weaver can tie about 10,000 knots per day. These rugs require skill and time when it comes to someone weaving one. The quality of a hand-knotted carpet is determined by the number of knots per square inch, and a higher density means better quality. The fringe is part of the rug and not sewn on after. Hand Tufted - These rugs are "hand made" by using a "tufting gun" punching strands of wool into a canvas stretched onto a frame. A piece of canvas is then latexed on the back fibers to hold them in place. 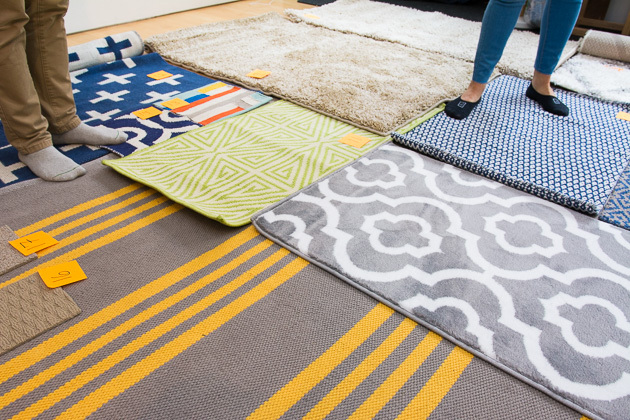 These rugs are made from start to finish in two to three days. They are less expensive than hand knotted rugs and generally look hand knotted to the untrained eye. Fringe is sometimes sewn on after the rug is finished. These rugs are weaving from the nation of Afghanistan. The majority of these rugs are wool knots woven onto a wool or flax foundation. The wool fringe is an off-white, beige, or brown color. The color scheme of the field generally incorporates bright reds and black. They also produce "war rugs" with military designs in the field. Though there are room-size finely woven rugs from Afghanistan, many of the pieces brought into the United States are true tribal weavings in smaller sizes, and because they are woven on smaller looms (and often during traveling if the weavers are nomadic), they do not have the symmetry or stability of the city factory woven rugs. For many, this "less than perfect" and more creative quality is what draws some consumers to collect tribal pieces. These are rugs that have been over-dyed with a brown or golden dye to darken the rug's look and to make it appear to have the look of an "older" rug. The solution used to over-dye the rug looks similar to tea, which leads to the term "tea wash". The darker color is either sprayed on to the rug, or the rug is soaked in the solution. Many of these solutions are not permanent, and can be removed with just water. The tell-tale signs for these rugs are cotton fringes that are brown or golden instead of white. Usually you can untwist a single tassel and discover the "white" underneath. Sometimes rugs are given a "tea wash" because they have past color bleeding damage or stains that the retailer wants to "hide" with the over-dying process to see a damaged rug at a higher "undamaged" price. Reputable rug dealers do not pursue these unethical practices. In most cases, this "over-dye" process will wash out unevenly, giving the field of the rug a blotchy look, and the fringe will become unevenly whiter as well. Dirt is abrasive and is the leading cause of rug fiber damage and loss. The more soil that is ground into your rug's fibers, the shorter life your rug will have. Rugs under normal use should be professionally cleaned at least once every two years. If left for an extended period of time, soil ground into a rug's foundation fibers can contribute to the growth of mildew and dry rot, which can cause structural damage to older rugs. Certain contaminants can also contribute to discoloration of the rug fibers. Soil from food sources can lead to insect activity and damage and make your rug a breeding ground for a wide variety of insects. Even insects that do not typically feed on wool or silk will do so if the fiber is covered with food or drink spills. Also, soil is more than just dirt and grime. It is a wide variety of contaminants that have come into your indoor air and on everyone's shoes (or paws), like car exhaust, smoke, mold spores, allergens, dust mites, cooking odors, aerosol chemical sprays, bacteria, and germs. Frequent proper cleaning of carpeting, upholstery, and rugs contributes to improving the indoor health of your home. Besides damage to the rug's fibers and foundation, heavy soil can cover up pre-existing rug conditions that a skilled rug cleaner needs to identify before beginning the cleaning process, such as pre-existing dye bleed in the fibers or the presence of certain stains. As with wool rugs, the quality of silk rugs varies enormously - from high end investment grade silk weavings to lower end silk "blends" and "art" (artificial) silk rugs. Silk has a luxurious and bright look that makes even less-than-high quality rugs appealing to look at. These rugs have a very noticeable light and dark direction as you walk around the rug to view it. The fine threads also enable a weaver to create very detailed and beautiful designs in the investment grade pieces. Artificial silk rugs are generally a blend of low-grade (or damaged) silk and rayon, and are primarily found from China and India. It is uncommon to find a room size "100% silk" rug... chances are that if a "silk looking" rug is larger than 5x7, it is a blend or artificial silk rug, especially if the rug is from China. Generally, these artificial rugs respond well to cleaning (despite their problems) and are much more affordable, costing several hundred dollars rather than the thousands that true silk rugs command. Pet urine (and pet vomit) goes on to your rug and becomes acidic. With the heat causing rug dyes to bleed, it also causes the urea in the urine to discolor the fibers yellow, and the acidity "sets" all of this damage in place. It is as if the rug has been re-dyed. The heat also causes the stain to penetrate the fuzzy fibers and go into the inside of the rug's foundation fibers. Most rugs are woven on a cotton foundation. Each single strand of cotton fringe runs all the way through the rug to the opposite side. This cotton "skeleton" absorbs the pet urine and is difficult to remove. Most contemporary rugs are chemically treated (especially with rugs from China and Pakistan), which makes them sensitive to sun fade and also to stains. Pet stains on these rugs cause a loss of dye that is permanent unless you treat it quickly. Besides the immediate damage of discoloration and odor, the long term damage from pet stains can contribute to a dissolving of the rug's dyes. Old pet urine stains go from an acid stain when fresh, to an alkaline stain when they sit for weeks. This alkalinity causes the chemical bond of rug acid dyes to wool to shift and the fiber releases the dye and there is a loss of color. Again, if you live in Montclair and are interested in using our services for your area rug, you can call us at 1 (800) 848-8385.